It’s been 16 years since Signature Theatre under the direction of Eric Schaeffer, mounted Sunday in the Park with George – Stephen Sondheim and James Lapine’s Pulitzer and Tony Award-winning musical. Back then it starred my niece Liz Larsen as Dot (Family plug: She is currently on Broadway in Beautiful: The Carole King Musical), and her husband Sal Viviano as George. Though they were both nominated for Helen Hayes Awards, it was Liz that came away with the honors for “Outstanding Lead Actress in a Musical” and we all celebrated at a glittering evening at the Kennedy Center. 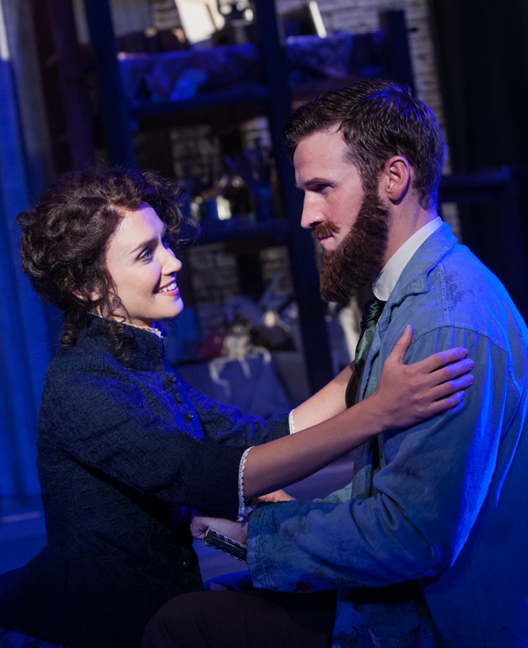 Fast forward to the latest production under the superb direction of Matthew Gardiner who has cast heavyweight Broadway stars Brynn O’Malley in the role of Dot, and Claybourne Elder as George, to bring to the stage this living, breathing, kaleidoscopic vision of Artist and Pointillist George Seurat’s life. Based on an imaginative interpretation of the characters in this iconic painting, “A Sunday Afternoon on the Island of La Grande Jatte”, the show opens onto the Paris artist’s atelier where a simple chiaroscuro backdrop echoes the 28 sketches Seurat made before completing his enormous masterpiece. Seurat was exploring the new science of color dynamics and attempting to create a new art form, at a time when his peers were deeply immersed in Impressionism. Set in the latter part of the 19th century when women wore corsets and bustles and men never went out without a proper topper, the painting emerges as the vehicle and backdrop for a tableau vivant of fifteen subjects who step out of the painting and come to life, revealing their very human characteristics. Frank Labovitz’s period costumes of soft colors and subdued prints blend seamlessly with the muted colors of the painting. 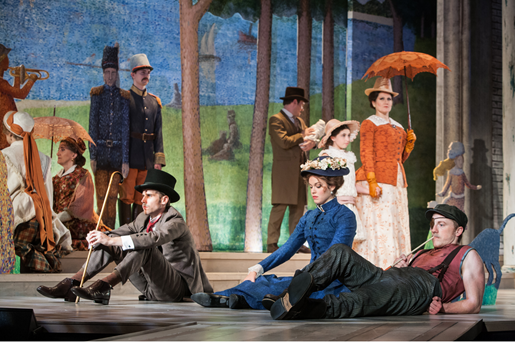 Brynn O’Malley (Dot) and Claybourne Elder (George) in Sunday in the Park with George. Photo by Christopher Mueller. As George taps dots onto the canvas, model and paramour, Dot, poses with her parasol held aloft, echoing her prominent role in the painting. She is frustrated by the heat, her constricting attire and his lack of interest. “If I were a Follies girl,” she wistfully sighs. In the song, “Color and Light” we become aware that his obsession, trumps all romance. And in “We Do Not Belong Together” they early on become resigned to abandon their love. “You are complete, I am unfinished,” Dot intuits. He proves she is right in “Finishing the Hat”, in which he sacrifices their time together for his art. Elder must give a tightly wound, highly controlled portrayal of the emotionally disconnected artist, and he does that quite convincingly, while O’Malley counterbalances it with a lithely lyrical Dot. Daniel Conway’s set design reflects the artist’s struggle to achieve “order, design, composition, tone, form, symmetry and balance”. He enforces that passion by eliminating and adding back silk-screened trees, dogs and a lone monkey according to George’s indecisiveness. The Boatman, played marvelously by Paul Scanlan, comes to life as a smarmy low life who likes to terrify frolicking children when he is not insulting George. Mitchell Hebert is Jules, a fellow artist and staunch critic of George’s new art. Together with his wife, Yvonne (Valerie Leonard), Mr. (Dan Manning) and Mrs. (Maria Egler) they provide brisk and hilarious diversion. By Act Two we have left the Victorian era and are transplanted into the present day. George’s great grandson is unveiling a light machine called a “Chromolume”, at a swank Paris gallery, and in “Putting It Together”- “link by link, drink by drink, mink by mink” – he schmoozes well-heeled patrons hoping they’ll underwrite his invention. This is where Lighting Designer Jennifer Schriever really displays her wizardry in a spectacular array of whirling pointillist beams of light and framed pixels of swirling primary colors. Accompanying her grandson is George’s wheelchair-bound mother, also played by O’Malley, who sings the poignant tune, “Children and Art”, a tenderly wrought and exquisitely sung number that will rip your heart out. Through September 21st 2014 at Signature Theatre (Shirlington Village), 4200 Campbell Avenue, Arlington, VA 22206. For tickets and information call 703 820-9771 or visit www.signature-theatre.org.